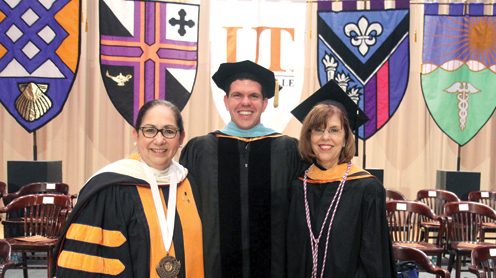 BROWNSVILLE – More than 1,400 graduates, including Port Isabel High School Principal William Roach received certificates and degrees at the 17th Winter Commencement for The University of Texas at Brownsville and Texas Southmost College on Saturday, Dec. 17. The graduating class is the largest in the university’s history. The original single ceremony planned for the Cardenas South Hall Lawn was moved indoors earlier this week to Jacob Brown Auditorium due to inclement weather. Students were divided by their degrees, colleges and schools for three ceremonies held in the morning and afternoon. Overflow viewing areas were opened at The Arts Center and Garza Gym for the large audiences. Want the whole story? Pick up a copy of the Jan. 2 edition of the Port Isabel-South Padre Press, or subscribe to our E-Edition by clicking here.